The importance of branding design on packaging is beyond two dimensional. Finding a connection between branding and hands on user experience is far more powerful and effective. When a user sees a difference and then experiences the same with function and touch, during use, they are connected to the product. That combination of appearance and sensory design is where we excel. Whether you’re launching a new product or want to breathe new life into an existing brand, or trying to solve a very technical packaging challenge, we bring unrivaled knowledge, strategic acumen, technical experience and creative talent that lead to proven results. TKDG has solved many packaging challenges for consumer, medical, and industrial portfolios with creative engineering and innovative design. Understanding our partners, their products, their unique needs, and most importantly, the end user’s desires, allows us to identify and create truly compelling solutions. Our methodology also creates a rich landscape of intellectual property for our clients. The Design to Simplify Challenge: Design a dental floss dispenser that would ensure that floss material could be delivered smoothly at all times without jamming or falling back into the container. TKDG developed a new ergonomic design and mechanical design that contributed to a new line of dental floss dispensers. The Design challenge: TKDG was retained to design the next generation paint container that would be injection Molded Plastic and had to work with the existing filling and handling equipment in the manufacturing plant. TKDG conducted extensive field research and interviewed users in their work place, construction sites, DIY and professional retail outlets, homes etc. We identified design opportunities with mapping and strategy analysis. TKDG embodied new ergonomic features to assist with opening, pouring and closure for DIY users and simultaneously address the professional who applies techniques that are different. TKDG created an ergonomically assisted twist open lid with integrated pour feature that is easy to open / close and carry. For the contract painter this design provided features like the finger perch handle that complimented their techniques in cutting and painting a room with container balanced in hand. The Design Challenge: Deliver turnkey design services for developing the first home use, over-the-counter, FDA approved HIV screening test kit. Through its multidisciplinary industrial design services, TKDG developed the kit design from the early concept stages through regulatory agency reviews and final production processes. Extensive human factors and user-behavior research was conducted to ensure the kit would produce reliable and predictable compliance. The patented packaging met stringent government requirements that users have immediate success with the kit and that the mailer provide a safe way to send blood through the mail. The Design Challenge: Create a branding identity and innovative packaging design that eliminated problems in opening and holding the medical package. TKDG created a package design that not only was easier to hold, but also combined images and color schemes that helped relieve patient tension. The Design Challenge: Create a packaging system that was stable, safe, easy-to-open, and could be easily transported by users and the manufacturer. TKDG designed a packaging system that could be integrated into the company’s existing lab environment and established a brand identity for the product. The packaging had to protect tissue samples from potential damage caused by dry ice. Through packaging design and prototyping services, TKDG developed a brand identity for the packaging that reinforced the high value of the product in an aesthetically pleasing way. The Design Challenge: Design packaging for an emergency contraceptive product that would make the product easy to use and reassuring for the user. Based on extensive design research, including visits with doctors, pharmacists, manufacturers and focus groups, TKDG developed the first product in the segment that met stringent Food and Drug Administration (FDA) requirements for clarity and ease of use. The Design Challenge: Design and engineer the packaging and delivery system, including glass syringe, blister package, and carton boxes. TKDG developed the brand identity as well as the Common Euro (CE) multilingual insert as part of cohesive packaging design and prototyping. The Medical Industry Packaging Design Challenge: Develop an integrated system for packaging an orthopedic fracture management system. The TKDG team developed the structural packaging, brand identity, and color coding system for a product line with upwards of 300 different shapes, sizes, and configurations. The project also involved helping Johnson & Johnson address the Common Euro (CE) multilingual compliance requirements. Design Challenge: ConvaTec wanted to reconfigure their packaging system for hydrocolloid wound care management products, consolidating an inventory of over 40 different package structures and sizes into manageable inventory of 10. The system had to comply with global packaging initiatives; differentiate material choice, indicate size, count, clinical requirements, and application. TKDG utilized a systems approach that reduced inventory count and developed a modular box design implemented with multiuse inserts. The use of color coding and over labeling with ink jet provided legible graphics that were easy to read for select the proper dressing without mistakes in selection. Design Challenge: Develop a long term 100 % effective moisture barrier package of Reliance®; a dry, single-use, high level disinfectant. STERIS also demanded a bulk packaging system that would safely protect 5 single use containers from exposure to any moisture at any time over a 3 year period. 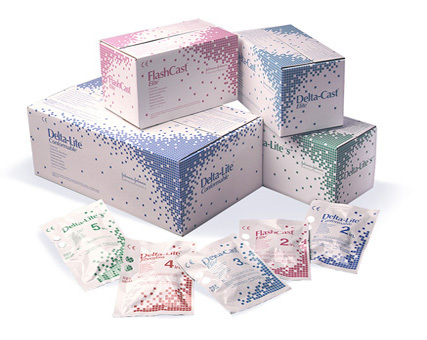 The peroxide based dry formulation is extremely sensitive and moisture would degrade the sterilization outcome. TKDG developed an innovative solution for a very challenging problem by formulating a new custom composite of foils and film laminated pouch to preclude any moisture permeation and damage. We tapped into the knowledge and experience we have cultivated with several film suppliers. We specified multiple formulations based on different performance projections and obtained sample runs suitable for prototype and accelerated environmental testing with a selection of material options. The packaging structure tested absolutely reliable. In addition, TKDG completed the multilingual labeling and graphic templates. Design Challenge: In the retail setting, many consumers desire to sample the scent of the product that they considering purchasing. At the same time many packaging is utilized with a tamper evident seal that prevents any transmission of product including scent. Often the consumer violate the seal to sample the scent; the package is then compromised. The client asked TKDG to explore a new approach for scent sampling closure design without compromising the protective seal. The proposed design had to conform to the high speed automated fill and RF seal machinery that was in place. We developed 15 concept prototypes that illustrated different configurations and methods that would provide the sensory exposure of scent without compromising the seal. Our creative thinking and knowledge of new materials and process methodologies enable TKDG to transcend the traditional thinking that would preclude a reasonable solution.